Disclaimer: This is an old food post of mine that I ate before I cut gluten out of my diet. When my family travels, I find that we usually have a different "objective" than most families. We spend equal time going to the local museums as we do going to the local grocery stores and wet markets. When seeing the famous sights and museums, we tend to get distracted and veer into local holes in the wall or established restaurants. In other words, my family is weird.. However this time my dad chose to take our family to the three Michelin star restaurant located in the quiet suburb of Minato-ku in Tokyo. The area was absolutely adorable, adorable. Little convenience stores, luxury boutiques, a high-end pet shop, and numerous salons and spas. However, the area was surprisingly residential! I didn't expect a three star Michelin restaurant in the middle of a quiet suburb. 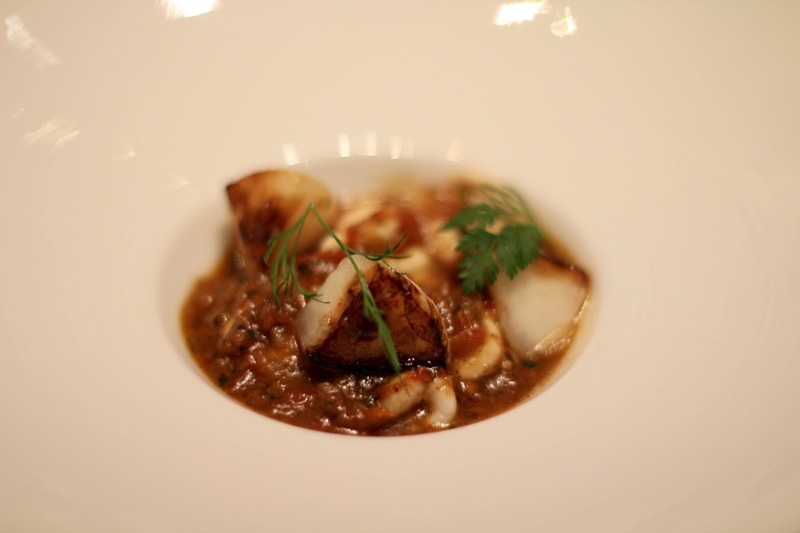 Although, did you guys know that Tokyo currently has more Michelin stars than Paris? 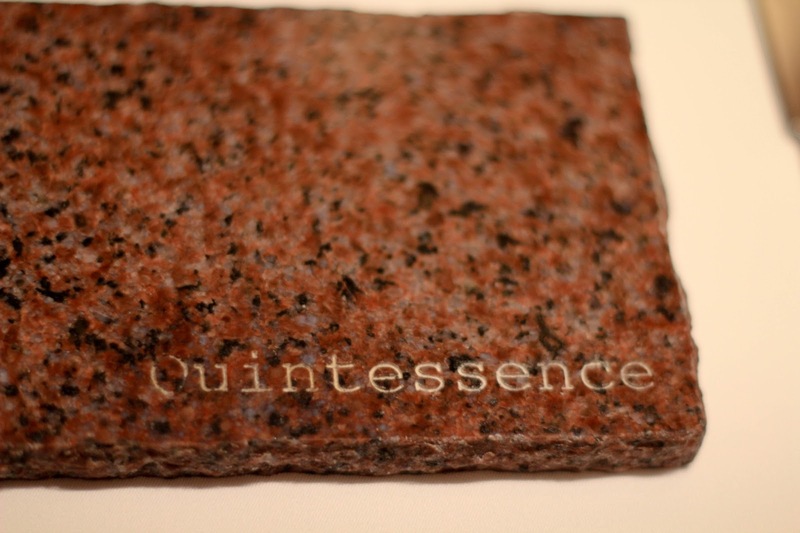 Quintessence is small, clean, and sophisticated. Everything about the whole restaurant gave the appearance of a well run machine, both in the front of the house and the back, and everyone there: waiters, sommeliers, patrons, and hostesses, simply exuded class and luxury. I, of course forgot we were eating at a fancy place for lunch and decided to dress in odd fitting jeans, denim shirt, and heat tech turtle neck. Can you guess who didn't fit in with the rest of the restaurant? Answer: ME. Honestly, it was just a wonderful experience. All the staff were polite and kind, incredibly gracious and took extreme steps to make sure that we were accommodated in every single way. 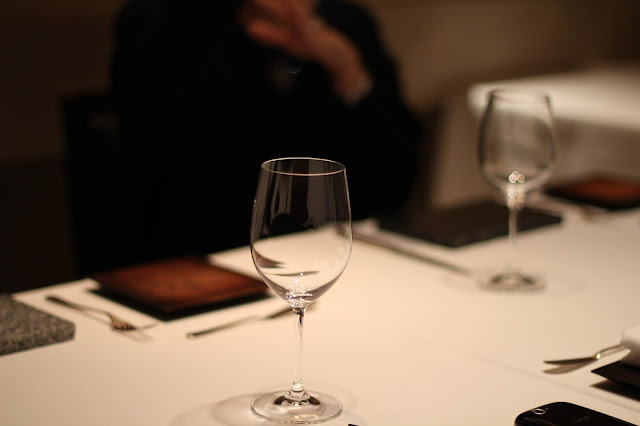 We were seated quickly in a private room with a futuristic "light dimmer"that turned the transparent glass looking out into the main dining room opaque with a flip of a switch. It is a known fact that my family and I don't speak much Japanese and the internal staff of the restaurant made sure we had a server with fluent English skills. Our server, who was also a sommelier, was incredibly humble about his English skills. He said his English was "bad", but he was able to banter and joke with us in ease. Near the middle of our meal, he bashfully told us that his French was much better than his English. Essentially, he was a tri-lingual language master. He was absolutely lovely and all the staff in the restaurant were just on point. From the service to the food all the way down to the cutlery. Did you know each diner gets individual granite serving plates? Such personalization! Such a efficiently run machine with staff that actually care. I loved it, my family loved it, and honestly we had a sublime meal that we were able to catch up and bond over. 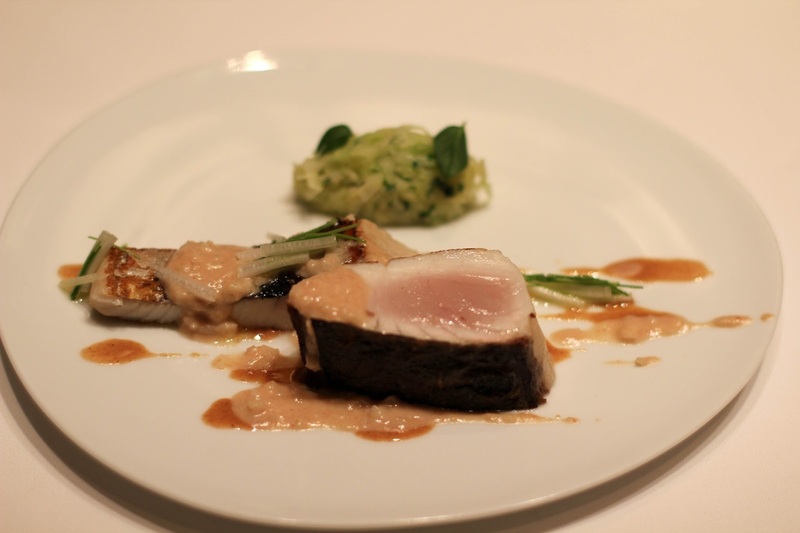 After training in Japan, Chef Shuzo Kishida's perfected his skills in France, notably at Parisian restaurant, Astrance. So inspired was he that he bases the menu carte blanche- under which different dishes are created for each table - on available ingredients as well as his own inclination. Particular care is paid to the roasting and boiling of meat and fish. Reservation calls are only accepted 9:30-11:00 and 15:30-17:00. My family had decided on taking the lunch service, which included a seven course set meal. On the way over, we were debating on whether or not Chef Kishida truly made different dishes for each table, but upon being seated we were presented with Quintessence's weighty leather bound menus. When we opened them up we were treated to a blank surprise the menu was carte blanche, as we were told by the Michelin Guide, with the left side of the menu dictating the restaurant's mission statement and its promise to use the freshest products and elevate them using the finest techniques and fundamentals of cooking, summarized into the "Three Processes". 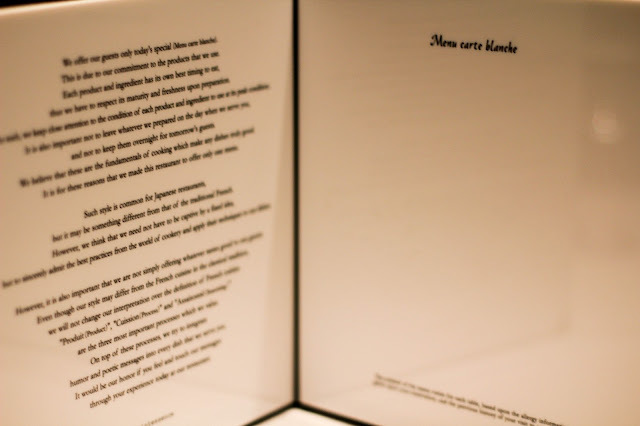 Attention to detail in “assaisonné"
Even though it was well known the menu was carte blanche, I still appreciated the ceremony of taking out the menus and letting us read over them. It felt like the opening ceremony of a very grand event. Unfortunately, because of the customization of each dish, I only have some basic information about each. A simple warm Uni shooter started off our delicious meal. Simple, elegant, and a spin on something that I've tasted many times before. I have to say, I love the natural sweet, creamy flavors inherent to uni, but something must be said for a chef with the ability to elevate and transform the original flavor into something even more delicious and complex. The uni that was placed within this shooter was flown in from Hokkaido and surrounded with a hearty, herbaceous spinach soup. The soup, as our server kindly told us, was created with herbs and veggies found only native to Japan, and as such, have names that were a bit difficult in translation. The only one that I outstandingly remember was Japanese spinach, but the others were a bit more obscure, like, shepherds purse, nipplewort, and water dropwort. The large slices of Uni that people usually eat in North America are harvested from or go through Santa Barbara. I find that Santa Barbaria Uni, although larger and more impressive to serve, often has the tendency to be bitter or discolored compared to its smaller Hokkaido born cousins. Hokkaido uni is unrivaled in its creamy, rich taste and its natural sweetness. 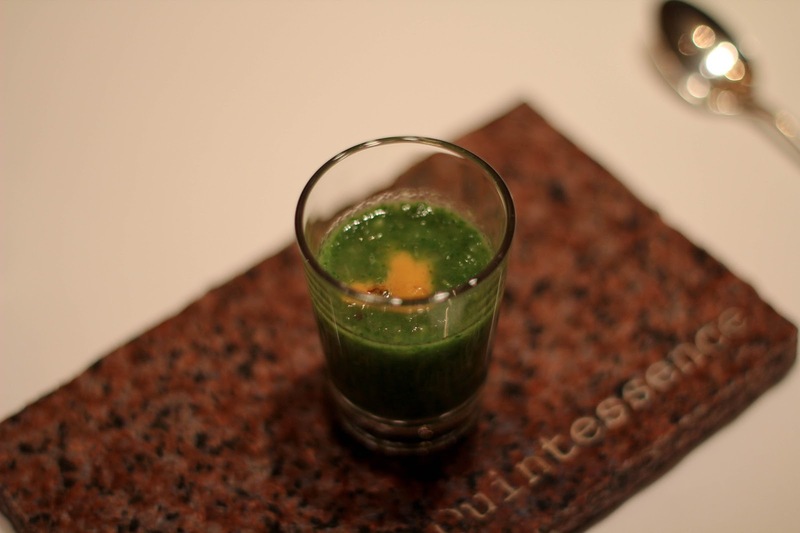 It was a delight to have the gem elevated within the bright, fresh herb soup. Humble in appearance, this goat milk bavarios was actually one of my favourite dishes of the entire meal. I feel like Chef Kishida's character and ingenuity really show themselves in this little dish. 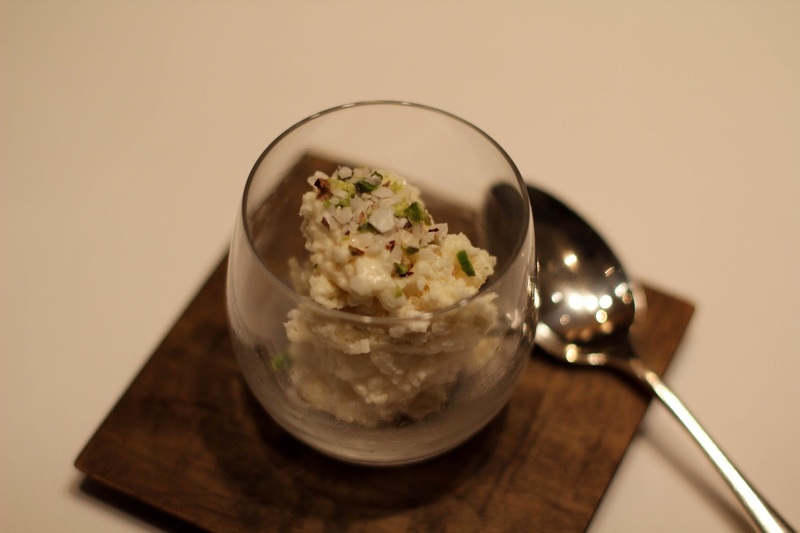 The creamy, whipped goat's milk that was gently spooned into the porcelain bowl was a literal kaleidoscope of flavors and textures. Depending on the ratio of ingredients scooped up on your spoon the taste of the bavarois would vary wildly, ranging from sweet and creamy to tart and salty. By the time I finished the dish the only thing on my mind was the desire to order more. Every component of this dish was seemingly flown or driven in from its native homeland. 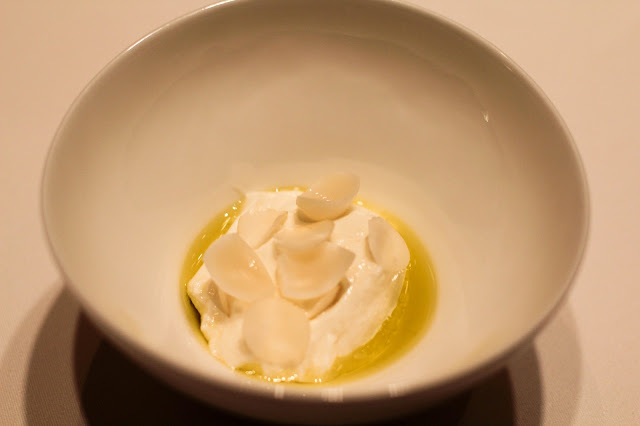 The goat's milk was driven in that morning from a farm in Hokkaido, while the olive oil was hand picked from a selection in France, the lily bulbs picked from local growers...it was out of this world luxurious. However, to top the whole dish off the olive oil was probably the most luxurious ingredient. It was so light and filled with bright, fresh olive flavor. Honestly, I feel as if I could have drank the oil out of a wine glass, it was so delicious. Chef Kishida's bavarios differs greatly from the traditional renditions of Bavarian Cream. It was clear this dish was a savory appetizer as opposed to a sweet dessert. The goat's milk was so incredibly fresh and naturally very creamy all the tartness that one finds in traditional fermented goat products was almost ephemeral in the whipped milk. The goat's milk was definitely in its finest form, for it was delightfully creamy and tart, but not mouth puckeringly so. The whipped bavarois really acted as a foil to the natural oily, nuttiness of the macademia, the starchiness of the lily bulb, and slight saltiness of the fleur de sel; while the components sprinkled on top added texture to what could have been a rather one dimensional dish. Now, the main ingredient of this dish will surely turn some heads or stomachs. You have to ask yourself though, before I reveal the mystery ingredient, does this dish look good? Yes. A resounding yes. Now what is "soft roe"? In layman's terms...fish sperm or fish milt. Are you afraid? Don't be! It's delicious. After my first trip to Japan, when I was thirteen, I made the mistake of telling my classmates that I really enjoyed fish sperm and was the subject of ridicule for several years. The only thing that I take solace in is that fact that I'll probably enjoy fish milt for the rest of my life, while they'll be too afraid to try it. While the fish milt was the pièce de résistance of the dish, it was also paired with some chunked seared lily bulb. Again Chef Kishida's approach to the soft roe was something that I've never tasted before. After all, this delicious roe was served to us in the form of ragu, something markedly different from the clear Japanese soups I've previously drunk. This dish definitely reads as sweet and I was surprised how much sweetness the stewing process imparted to the tomatoes and herbs within the ragu base. Although eaten together, and very delicious, I really appreciated the effort that it took to cook each of the ingredients to perfection individually. Each one was cooked so that their natural flavor would reach its natural peak: the soft, but firm fish milt, the starchy, roasted lily bulb, and the sweet, roasted tomato ragu...all came together within this little ceramic bowl. 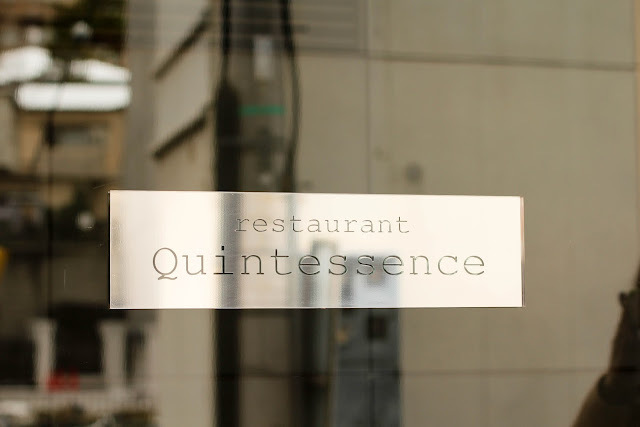 As stated in the Michelin Guide, Quintessence really does take pride in the process of cooking fish and meat. One of the ways the nodoguro was prepared was a "flash cooking" method in a 300 degree oven, so it rendered the outside completely cooked and the middle still pink, despite being completely cooked. The long sliver of fish meat at the back was pan seared to crispy skinned perfection. Both preparations of the fish were absolutely spot on, and despite the differences in cooking technique the fish meat was deliciously moist. Although a knife was presented, I could cut the fish with ease using only a fork. The sea perch was more than just fork tender, it was almost immaterial. Both of these methods highlighted and elevated the natural oily flavors of the fish, but were then further elevated by the peanut sauce smattered on the plate. The oil from the peanuts and the oil from the fish blended together nicely, although unexpectedly, and some texture was added with the use of young Japanese celery sprinkled on top. The shredded cabbage at the back was blanched and added a slight sweetness and a fresh foil to the rich fish. My mother, sister and I all enjoyed this dish immensely, but my father, who dislikes peanut sauces, was only moderately wowed. 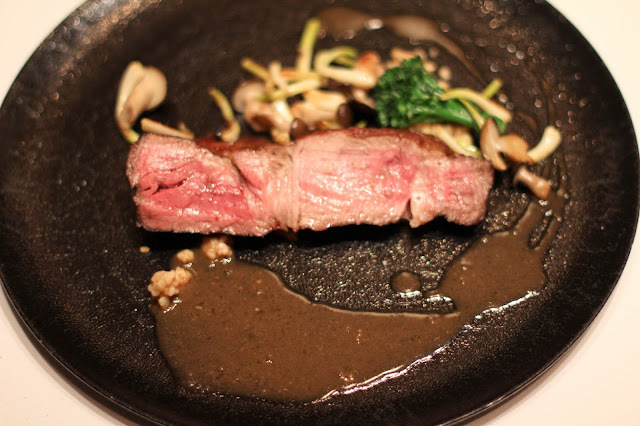 Chef Kishida used the famous black pig, the kurobuta of Kagoshima prefecture, for his meat portion of our meal. To cook the pork, it seems that he used a faux "sous vide" method of cooking, but instead of circulating water and low temperature, the kitchen used a low heat oven and rotating periods of cooking and rest to thoroughly cook this meat. The total cooking process takes about three hours, while the meat alternates between one minute of cooking and five minutes of rest. Although pork should never be served "raw" or "medium rare", Quintessence's labor intensive way of cooking allowed the pork to remain "pink" while being fully cooked and safe to eat. Not only that, but the pork is absolutely tender, juicy, and succulent. Although for this dish, I did need to use the help of a knife to cut through the luscious meat my efforts were well rewarded. The labor and time intensive process used to cook the kurobuta was one my family both appreciated and marveled at. The pork was mouthwatering and delectable, tender, moist, and really filled with natural pork flavor. The savory gravy spooned onto the plate only added to the natural umami flavor of the pork. Quintessence's sauces never "cover up" the natural flavors on the main ingredient, but only serve to heighten or compliment the essences found naturally within their fresh ingredients. This dish was just so delicious and solid, but also simple and well rounded. The sauteed shimeji mushrooms, broccolini, and a kind of sansai (Japanese Wild Edible Plant) served as a side to the "baked" pork. I believe the vegetables were roasted in the excess juice from the pork, so the side and the main blended together very well. However, my dad said that he wasn't impressed by this dish. Perhaps this was aggravated by the simple fact that he got a more sinewy piece than the rest of us. After our first five luxurious savory courses, we were treated to this dessert opener. Crushed ice, with chunks of almond and pistachio, all saturated with a heavy dose of sweetened almond milk. Again, this was another dish that I wished I had a larger portion of. The ice was finely crushed and it really absorbed the viscous almond milk and the chunks of pistachio and almond really gave the shaved ice a nice textural dimension. The shavings of ice presented to us in this glass cub were very light and delicate in flavor and I could easily see myself enjoying this on a hot summer's day. It was really just like eating a cold almond nougat. Very addictive and very fresh. Surprisingly my dad, who absolutely hates sweets, loved this dish. Naturally all the ladies with sweet teeth loved it as well, but if it got the seal of approval from my dad you really know its delicious. Finally, we were presented the closer to our wonderful meal. 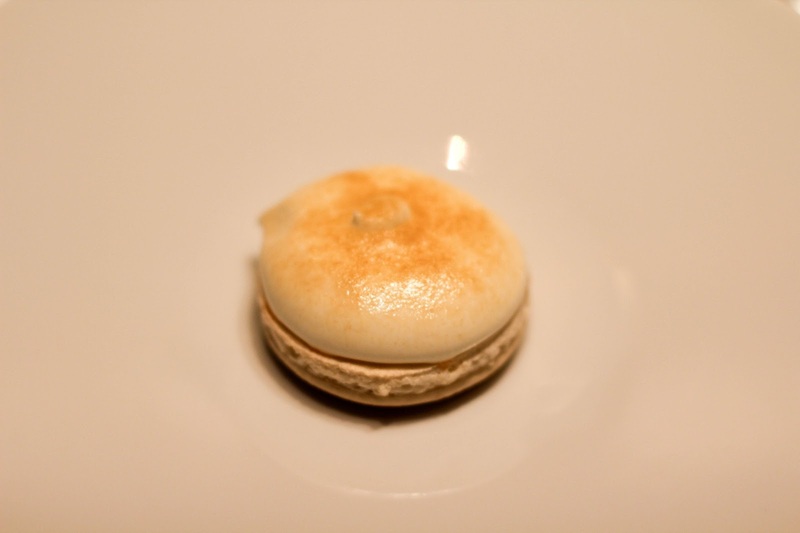 We were given a almond macaron with a passion fruit foam top, that was torched to give it that nice toasted appearance. I was a little surprised with its presentation, simply because it seemed like the plate was so bare, but this little macaron really packed quite the passion fruit filled punch. While passion fruit is naturally quite tart, and can be the victim to over sweetening, Chef Kishida handled the natural tartness of the passion fruit quite well. He allowed the almond macaron base to supplement and cut through the tart passion fruit foam with its naturally mild flavor, but still allowed the essence of the passion fruit to show in the foam and accentuate it with some passion fruit seeds sandwiched in between the macaron and the foam. The execution of the macaron was flawless and the texture of the macaron was exactly the way a macaron should be; crunchy on the outside and chewy on the interior. Tart, sweet, crunchy, and chewy this little macaron was a perfect closing bite to a wonderful meal. Finally, I would strongly recommend Quintessence to anyone who wants a fine French meal in Tokyo. From the moment you walk through the door until the moment you're ready to slip on your coat again, you will be completely enraptured by the Quintessence experience. The atmosphere, ambiance, and food are personalized, memorable, and unbelievably delicious, all the while each individual aspect of the restaurant holds up their mission statement of the "3 Processes." It was a meal that easily wowed with ingenuity whether in presentation, flavor combinations, or cooking processes, and was held up by a very sturdy foundation of solid flavors. I really appreciated how the traditional Japanese meats and vegetables that appeared on our plates were reinvented through Chef Kishida's hands and French culinary training. In many ways Quintessence represents Tokyo itself, blending the traditional and modern elements, incorporating inspiration from different cultures, all the while deftly arranging all the pieces into a consolidated whole. However, while Tokyo is a bustling metropolis, Chef Kishida and his staff effortlessly carve out a quiet haven for anyone to escape the urban hustle and bustle and lose themselves within a meal. Honestly, this meal may not have been the meal with the "greenest footprint", given how all the ingredients were flown, carted, or driven in, but it is definitely one of the best meals I have had in recent memory. The Chef himself came out to wish us well after the meal was over! 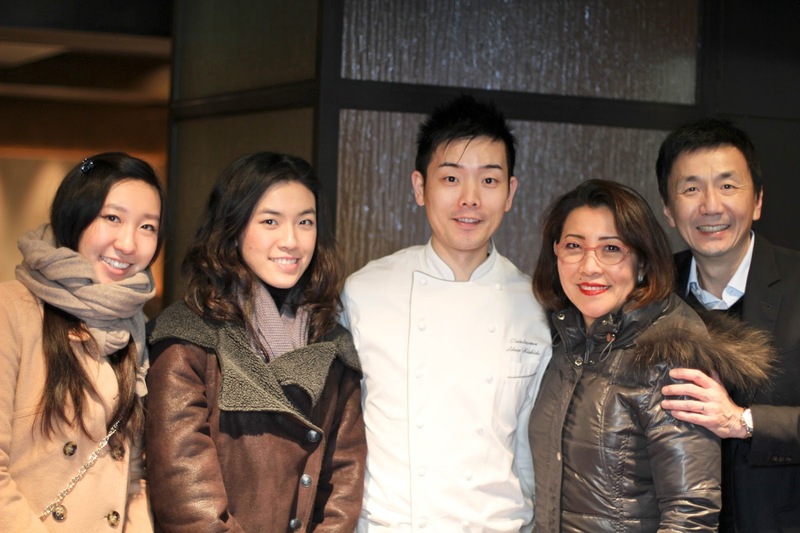 He thanked us for dining at his restaurant and said it was a pleasure to cook for us. We were both surprised and very thankful that the Chef came out to give us some face time. Once again, although we already thanked you in person, thank you so much Chef Kishida and the staff of Quintessence! You really made our lunch experience one to remember. I highly recommend Quintessence for anyone who wishes to go! Kid Friendly: Yes, I can see the staff and Chef Kishida himself accommodating any tot that wanders into his dining area.